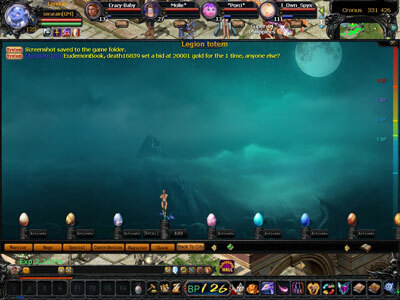 Once a legion is created, the Eudemon Totem button is added to the legion's window. The Legion Leader, Deputy and Leader's Spouse can access the Eudemon Totem window to purchase a Eudemon Totem. Registering a Eudemon on the totems. 1. All legion members can register their Eudemons on their Legion Eudemon Totem. 2. 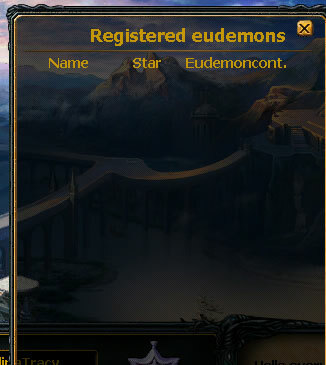 A registered Eudemons must be 5 stars or above. 3 . 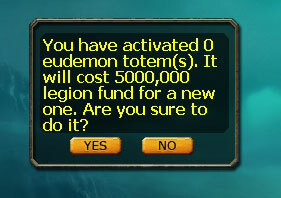 Only 50 Eudemons can be registered on a totem. After that, you cannot register more Eudemons unless your target Eudemon's stars are higher than that of the 50th Eudemon. If this happens, your registered Eudemon will replace the existing 50th Eudemon. 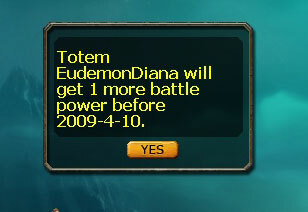 The higher level you reach, the more Eudemons you are allowed to register on the totems. 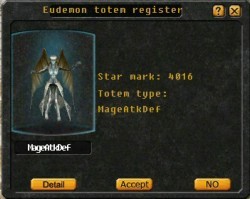 You can gain Eudemon contributions for registering your Eudemons on a totem. Your Eudemon contributions will affect your position within your legion. 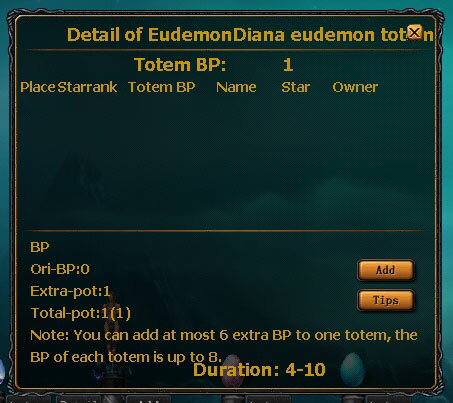 The totem Battle Power is calculated from the top 5 Eudemons on the totem. The legion Battle Power is the sum of the top 8 totem potencies. You can be rewarded with legion Battle Power according to your position in the legion. 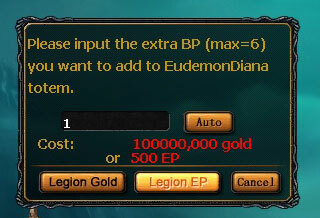 The higher your legion Battle Power, the more bonus Battle Power you will have. If your legion Battle Power is too low, you can enchant a totem to grant you more Battle Power. 1) Who can enchant a totem? The Legion Leader, Leader's Spouse, Deputy, Honor Deputy can use EPs or gold to enchant a totem; all legion members can use EPs to enchant a totem. 2) How many totem Battle Power can be enchanted? No more than six Battle Power. 3) How many Battle Power can a totem have? No more than 8 Battle Power. 4) What is required for enchanting? 1. Open the legion totem. 2. Check the totem you want to enchant and click "Add" on the Totem screen. 3. Use legion fund to enchant totem and enter the desired Battle Power. 4. The totem has been successfully enchanted. 5. 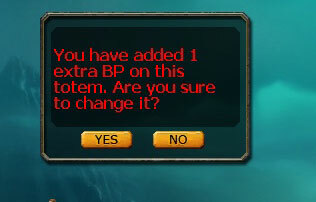 If you have added extra BP on this totem, you can also change it.